Artful Affirmations: Tea Cup Tuesday-Already! Is it just me or is the summer flying by??? Whew it is hot here, mid to high nineties every day. Guess I will have to stay indoors and craft! Today I am sharing a tea cup trio that I purchased in an antique store while in the UK this summer. I don't usually see trios, so this was a delight. I adore the roses on this set! I have seen others share it and versions of it, but until now I had not had my own...now I do. Yay! I love the dainty gold markings on the handle. This cup is footed with two gold bands as trim. 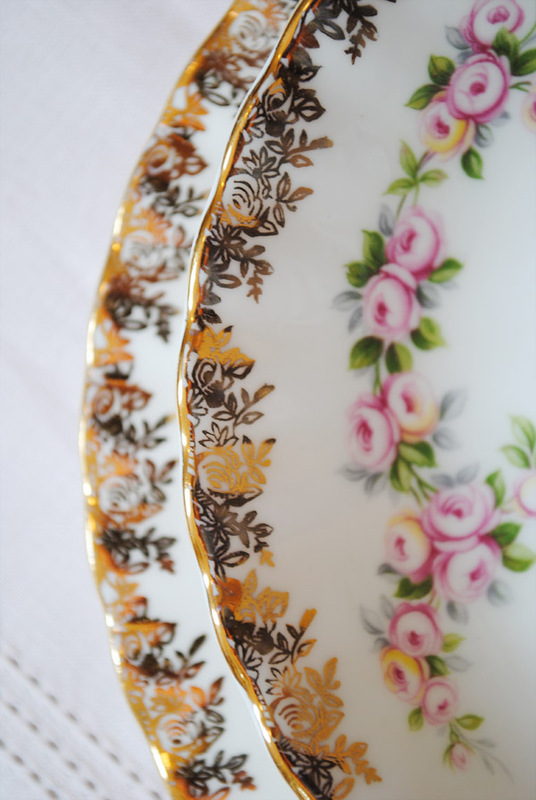 The rims of the cup and plates are heavily decorated with a gold floral pattern. These are the sweetest little roses! I also love the shade of green for the leaves. Gorgeous plate edges! Using this cup makes me feel almost royal! 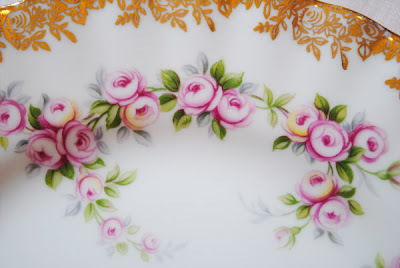 As you can see by the backstamp, it is created by Royal Albert, and the pattern name is Dimity Rose. Such a sweet name for such a sweet cup! Here is a dear little vintage tea cozy I found in another little antique shop in the UK this summer. Isn't it sweet too? It is quite small and would fit a 2 cup tea pot. I think it is adorable. I found another one while there and I will share it next week. How are you all doing this summer? Are you having your tea iced??? If you would like to join in for Tea Cup Tuesday with Martha and I, just go and create a post showing us your tea cup(s). Then come back here and link up below. Martha and I love coming to see you and your china! That is so pretty! A keeper for sure. Neat tea cozy too. Thanks for having us over! You must have a million and one tea cups by now! And I do love these latest!! They are divine. I love Dimity Rose by RA! I don't own one but I'm always keeping my eye out for one. How nice that you found the trio too. Sweet little tea cozy. You did well in the UK. Thanks for sharing your pretties and for stopping by for a visit. My Japanese cup has a sticker and it is made by Lenwile China. The sticker is on both cup and saucer. Lovely trio. I love Royal Albert and the tea cozy is wonderful! Think of all the work that went into that! I'm sure you'll treasureit! That cup is absolutely beautiful! The cozy is also nice. I can't wait to see the other one you found! Oh what a beautiful cup Terri. I love the sweet roses, and all the gold is so pretty. Love the cute tea cozy too. Thanks for sharing! beautiful teacup!! And the cozy is so cute! handmade I think. Oh well done in getting that trio home! 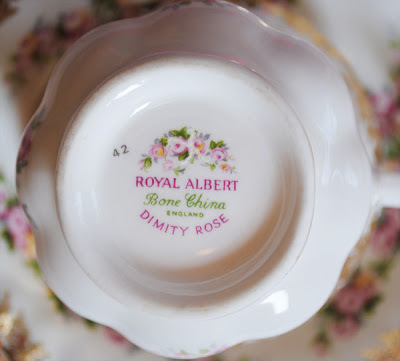 Royal Albert is still in production as far as I know. The gold leaf is applied by transfer - wet the carrier paper and slip it into position, sort of thing. I have a complete dinner and tea service of a Royal Albert pattern called Old Country Roses. Enjoy Dimity Rose, I think it's amongst their nicest designs! You found some lovely things in England. Thank you for taking me on a vicarious travel! I love both the tea cup and the cozy. I wonder if the shops there are rich with treasures or if these are a product of your good eye. Thank you for hostessing this. I am hoping to get a post up tomorrow. 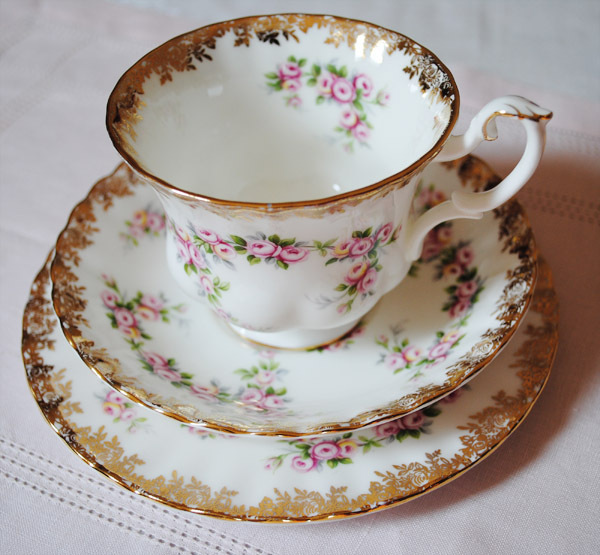 oooohhh what a gorgeous teacup trio that you bought in the UK! love the pattern, the design and the color!! 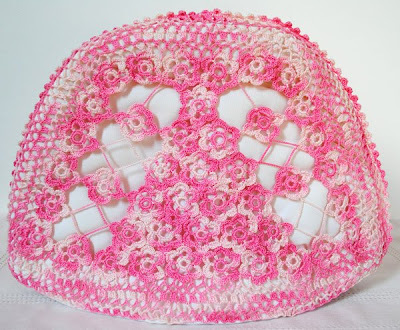 and the tea cozy u got is sooooo cutee, pink is my fave color! always enjoy visiting here and thank u for sharing and hosting! what treasures you have! How lucky. I adore tea cups myself and collect them as I antique shop as well. What a find! Yes, the summer has flown by - the boys have been back in school for over a week. Your Dimity Rose trio is so pretty and feminine. So is the crocheted (or is it tatting?) tea cozy. I love the varigated pink thread. The temperature is very high here too, but I still prefer my tea hot. Hi Terri - Looks like you had a wonderful time antiquing in the UK. Your teacup set is such a great find...very elegant and royal looking indeed. And love that pink tea cozy too. Someday, I'd like to go back to England and go antiquing myself. I linked up to your party this week because I found a teacup with two handles. Not sure if it's a teacup so what better place to ask what this dish really is...your teacup tuesday linky party of course! 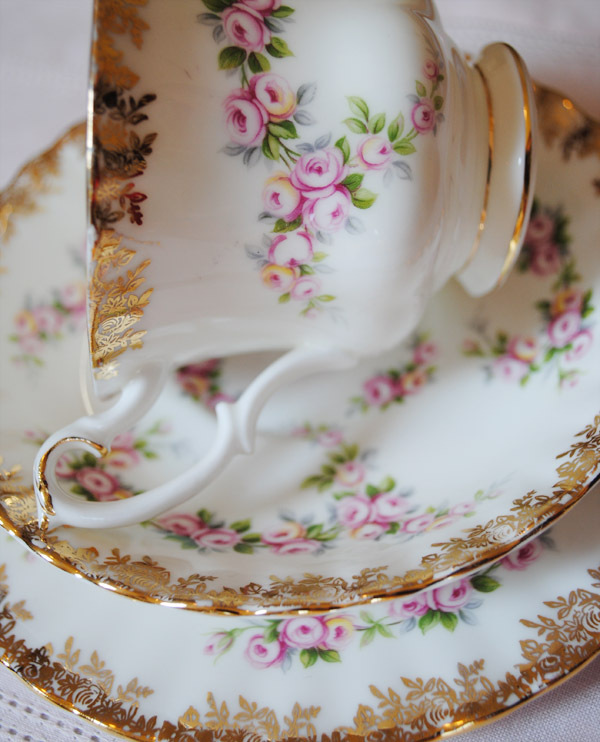 Royal Albert has always wonderful designs. I thought first it would be the Lavender rose pattern with additional gold decorations, but then I realized the different. I have never seen this beautiful pattern before. Thank you for showing us your treasures and for hosting this wonderful Tea Time Party. At least I could send my image! Your vintage tea cozy is adorable. You certainly made wonderful purchases while you were in England! Terri e colegas das postagens tenham todos uma excelente semana! Beautiful tea cup, and being a trio makes it more special! 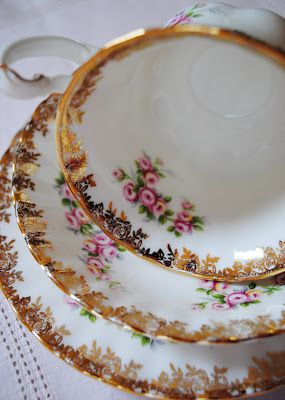 I love the Royal Albert china! Love that tea cozie. So adorable. Thanks for hosting. Oh my goodness what pretty pink treasures! 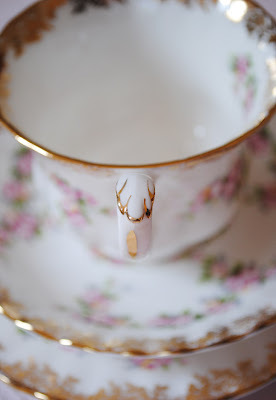 Oh my gosh, I'm in love with this tea cup trio, it's absolutely gorgeous. Can understand how you feel royal, a beautiful tea cup when enjoying tea makes all the difference in the world. 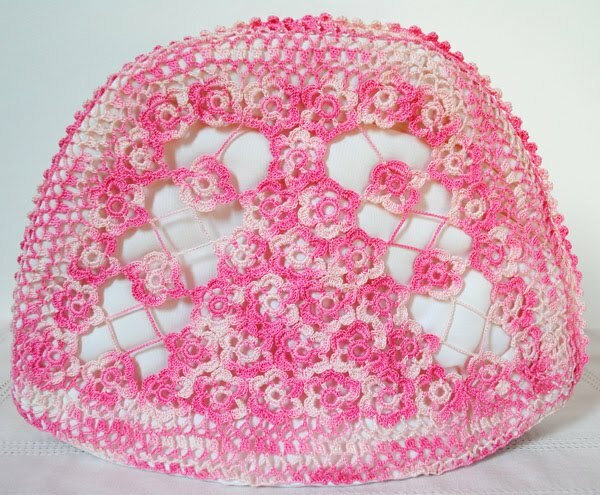 And that tea cozy, never saw one like that before, it's so dainty. I have the 'coffee' cup version of this! and I love it! I love how sweet and dainty this teacup is! 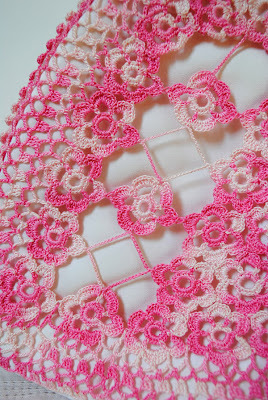 lovely pattern and oh so perfect!